The location was in the drive way of a small but very nice hotel in Washington DC. The "Take It!" was another one of those pass by it with the thought stream being - hmmm, unusual that they would have let even a piece of paper have a moment as litter in front of their very well maintained entrance. A few steps later - the image being ultra fresh in my mind caused a return for another look. The morning had included some rain and the bricks of the drive way were wet. This lone piece of paper just happened to be located on the drive and proceeded to become wet too. 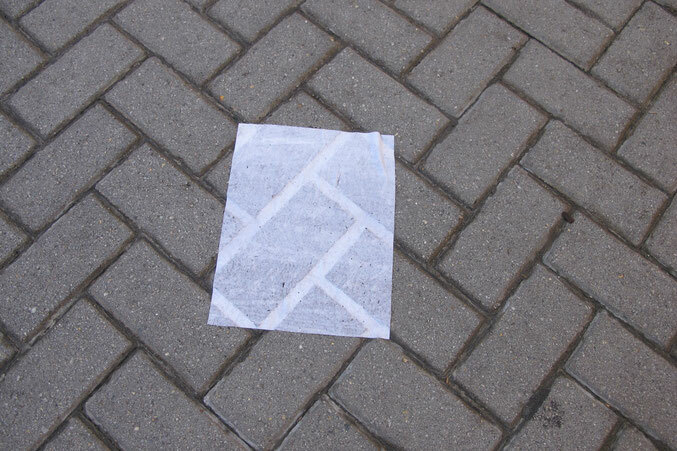 The wetness in the paper brought about a mild forming of itself to the bricks and the mortar that separates them. ( we can call it the wet T shirt effect ) The random positioning of the paper just seems to be eye catchingly perfect. The After Take: Everyone that I have shown this picture to likes it. When I share the story of having walked by it thinking of it as random trash - then having my double take - they all seem to step into sync with me and can completely relate. The simplicity of the shapes matched up with the wet contouring seems to not permit any temptation for complexity. There are times and things that are best left to being as they are, and this seems to be one of them. Here is hoping this image brings a certain calming to you. For some unknown reason - it has this effect upon me. I LOL'd HARD at the mention of wet t shirt effect. Trees love rain, paper not so much. Oh the irony! I think its really cool how the gaps between the bricks have remained very white while the rest of the page is dirty. This was a fun/funny read. Great sense of humor in there. Who wouldve thought a wasted piece of paper could turn out to be a piece of art work so to speak.